Entries are now being taken for the Microgaming Triathlon Festival Weekend. The Solo event is on Saturday 12th May, start time 9am. The Team event is on Sunday 13th May also starting at 9am. This gives any Individuals competing on the Saturday the chance to also take part with friends, family or team mates in the Team challenge on the Sunday. Entries numbers are restricted so be sure to get your entry in prior to the closing date of 5 MAY 2018. Premium Membership of Manx Tri Club will close to new members on 31 March 2018 (no exceptions). This is to facilitate entry for Standard members and non members to the May Solo event. Please refer to the membership information below for details of the benefits of becoming a member of Manx Tri Club. Entries are now open for the Microgaming Pay It Forward Junior Triathlon to be held at the NSC on Saturday 21st April 2018 at 9.30am. Having the pool, perimeter cycle track and running track at one location makes this an ideal location, great for youngsters to get involved in a traffic free environment and experience what it is to be a triathlete. For further information of race distances and entry click here. 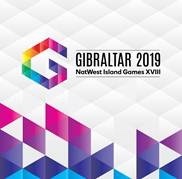 With athletes starting to enter races for 2018, it’s time to start thinking about the Island Games in Gibraltar in 2019, and we have set the following criteria for selection. · Eligible to compete by virtue of Island Games Criteria (i.e. Manx, IoM resident etc). · Current member British Triathlon. · Actively competing in 2017/2018 seasons. Between 1st January 2017 and 1st April 2019 athletes must achieve the consideration time at a recognised Standard / Olympic Distance event (1500m open water swim - 40k bike - 10k run) and evidence of results submitted to the head of performance (Paul Swindale). Isle of Man Triathlon Association Selection Committee has the right to award a discretionary team place where consideration time has not been met due to a specific reason (e.g. injury / age restriction on taking part in Standard distance event during qualification period / distance of event changed by organiser due to weather conditions etc. - this list is not exhaustive). For a discretionary place to be awarded the Committee will take into account results of other distance triathlons events / individual event performance such as open water swimming 1500m, 25mile Time Trial, and 10k running during the qualification period. Previous experience of racing over the standard triathlon distance 1500m, 40k, 10k in open water will also be taken into consideration. The rule from the IGA is that the minimum age for competitors is 18 on 31 December 2019. In view of the above potentially being new to some athletes arriving new to the sport or looking to move to triathlon from other disciplines, Paul Swindale and Juan Kinley will host a Q&A session at the NSC at 6.30pm on Thursday 25th January in order to help understand the basis of selection etc for the games team. The Annual general meeting is due to take place on Thursday 9th November staring at 6pm. The venue is upstairs at the IOM Sport Institute at the NSC. All members are welcome to attend. 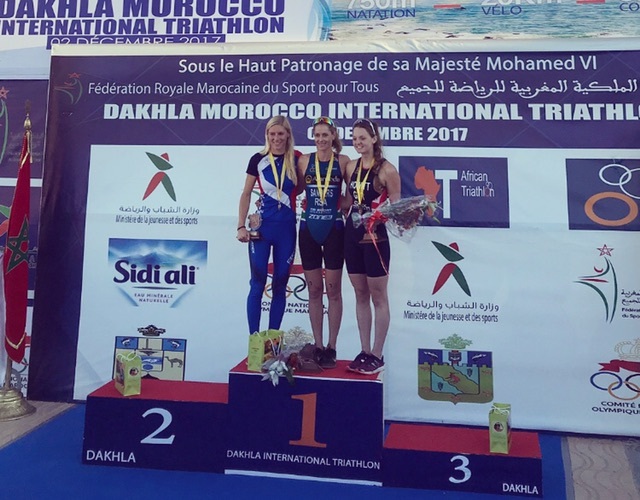 Manx triathletes Hannah Howitt and Jenny Newbery headed to Dakhla, Morocco, last weekend where they were both racing at the ITU Dakhla Continental Cup. Conditions were warm (around mid 20s) and the swim was wavy, so perfect for IOM athletes. Dakhla’s start list had some strong competition, including 2 time Olympian Gillian Sanders. Hannah had a great swim, coming out the water in first (with Jenny just 1 min 20 sec behind). After an extraordinarily long transition Hannah managed to get out in front for a windy bike leg (Dakhla is renown for kitesurfing and windsurfing due to relentless strong winds), forming a bike pack with Zoe Thomas (GB), Petra Kurikova (CZE) and Gillian Sanders (RSA) with the pack holding the break for the whole race. In the end it came down to a running race for the line. With some more run training behind her, Hannah managed to gain her first international elite podium, finishing in 3rd place in 1:08:23 behind Petra Kurikova (CZE) 1:07:06 and Gillian Sanders (RSA) 1:07:02. Zoe Thomas (GB) finished fourth in 1:09:22. Unfortunately due to a puncture Jenny wasn’t able to finish, but gained some good experience from her first full international race. This result qualifies Hannah to represent GB in World Cup races for the 2018 season. She is also targeting the U23 World Championships, European Championships and the University World Championships. Physical literacy will be the subject of this year’s annual Isle of Man Sport lecture. The lecture, on Thursday October 26th, 6.30pm, will be delivered by Phil Moreland, Head of Strength and Performance Conditioning at Sport Scotland’s Institute of Sport.